Neither Derbyshire nor Leicestershire were given the chance to take a consolation win as their Vitality Blast meeting at Derby was abandoned due to rain. The knockout stages of the competition were out of sight for both counties but a competitive match was in prospect before the weather worsened in the 15th over of Leicestershire’s innings and no further play was possible. 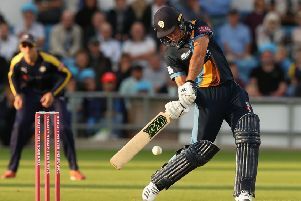 Batting was never likely to be easy for the Foxes after being put in on a miserable evening but it got tougher when a steady flow of wickets left them 50-4 in the eighth over. Neil Dexter was quickly into his stride but he was the first man out, pulling the first ball of Lockie Ferguson’s spell for his third boundary but then miscuing the second to give Matt Critchley a simple catch at point. That was 20-1 and Dexter had made 15 of them but opening partner Harry Swindells then took up the attack, hitting three fours of his own before pulling a ball from Ravi Rampaul to Billy Godleman at deep midwicket. It was 48-3 in the seventh over when Hardus Viljoen whistled a bouncer past the nose of Mark Cosgrove. The Australian was not impressed by the decision to give him out caught behind but he had to go and the Falcons were well on top. They were in even better shape when Ben Raine was dismissed by the athleticism and cool head of Calum MacLeod on the deep midwicket boundary. Raine connected cleanly with a pull and it would have gone for six but MacLeod caught it a yard inside the boundary and as his momentum took him back over the rope, he tossed the ball up to regather after he stepped back into the playing area. That was 50-4 in the eighth over and a wicket for Alex Hughes with his second ball – his 17th victim of the campaign, equalling Imran Tahir’s county record. Colin Ackermann and Ateeq Javid had a repair job on their hands and they set about it with patience. Derbyshire were content to give them the singles but Javid broke the shackles in the 14th over, diverting a short ball just wide of short third man and striking the next ball from Safyaan Sharif over long-off for six. The fifth-wicket pair brought up their 50 partnership in the next over but the steady drizzle which had been falling throughout turned heavier and the players were taken off four balls in into the 15th over with Leicestershire 103-4.